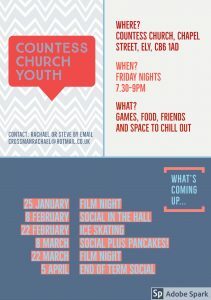 New to faith, exploring, or just want to hang out – young people are welcome to join us! We love investing in young people, helping them to discover faith that will enable them to flourish in the lives ahead of them. Our young people meet through the activities we have on certain Friday evenings, Sundays and at other times. We have a range of activities that take place at different times and places. Simply turn up on the Friday, or feel free to email us for more details and how we can enable you to stay plugged in! On Monday, Wednesday and Thursday lunch-times we will be in the chaplaincy room at Ely College for any Ely College pupil to call in. Come and explore what following Jesus means for you in your school as we explore together week by week. All welcome! The chaplaincy room is on the ground floor of the Needhams block (same corridor as vice principal’s office). Any pupil is welcome to come an join us! If you are using the Higher Tour App, you will find us listed as Ely College – Mondays / Ely College – Wednesdays / Ely College – Thursdays for you to select in the App.